Eagles' 2009 O-Line Actually Better than 2008? Putting aside for a moment the new quarterback behind center, conventional wisdom says that the Eagles offensive line needs to regain top form next year if the team has any hope of making a playoff run. 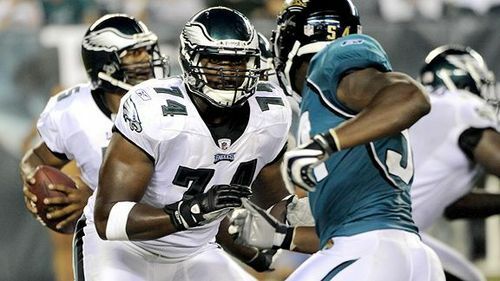 Last offseason the Eagles overhauled the line, removing veteran mainstays like Jon Runyan and Tra Thomas, and bringing in new players like Jason Peters and Stacey Andrews. Yet turnover was not the only problem. Injuries to basically every position crippled the unit, and poor performance from back-ups exacerbated the issues. This year’s group looked especially bad, considering the success the offensive line had in 2008 preventing sacks. Look at the change in Football Outsiders’ adjusted sack rate (a statistic I’ve referenced before). The Eagles went from only a 4.2% adjusted sack rate, 6th best in the NFL, to 6.6%, good for 20th. While two and a half percent may not seem like much, it accounts for a huge increase in sacks. But how much worse at pass protection was last year’s offensive line really? Adjusted sack rate only accounts for sacks — not hits or hurries. And it can’t really tell us whose fault those sacks were. 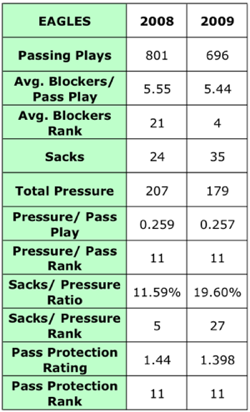 Pro Football Focus, a site that everyone who reads this blog really ought to have seen (if not spent hours reading through) put up a fabulous examination of pass protection that goes further than adjusted sack rate can. There’s a lot of information up there, but let me take you through it. Sacks jumped by almost 50% from 2008 to 2009, even though there were actually 100 fewer pass plays (fewer playoff games). We already knew that was a problem from adjusted sack rate. But: “total pressure” actually decreased. This is the first indication that sack numbers alone don’t tell us enough. While the sacks went up dramatically, pressure per pass play (a much better indicator of the success of the offensive line) stayed remarkably steady. And not only did pressure per play remain even year over year, last season’s offensive line actually did the “same” with less. In the last year of the Eagles’ longtime bookend offensive tackles, the team used more blockers on the average pass play than most teams — probably to cover up the fact that their two OTs were reaching the edge of retirement. However, in 2009, (even when dealing with constant injury problems) the Eagles used less extra blockers than almost anyone else. This fact suggests that last season’s hodgepodge offensive line was actually more effective at preventing pressure on the quarterback than the 2008 line. Donovan McNabb takes a lot more sacks than he should [in 2009]. He’s not Aaron Rodgers in this regard, but then he didn’t pass the ball as well as Aaron did, either. He seems to be hanging on to the ball more than he used to and is ranked 28th in terms of personal responsibility for pressure. It’s easy to formulate opinions as to why this was true last year — McNabb’s rib injury comes to mind — but regardless it suggests some optimism for the offensive line in 2010. Last year the unit performed just outside the top ten in pass blocking (and equal to the one that got the Eagles to the 2008 NFC Championship Game), so fans should be able to reasonably hope (if the OL can avoid the injury bug) for an elite pass-blocking offensive line in front of Kevin Kolb come September. Tagged with Offensive Line, Philadelphia Eagles, Sacks, Hits, Hurries, QB Pressure, Statistics, Ranks, Pass Plays, Donvan McNabb, Pro Football Focus, Football Outsiders.